Learn how to update to the latest release of QuickBooks Desktop. 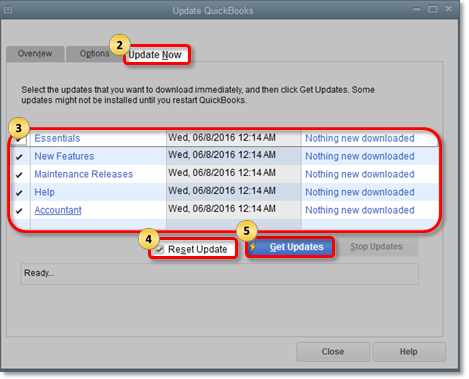 You can update your QuickBooks Desktop to the latest release either automatically or manually. 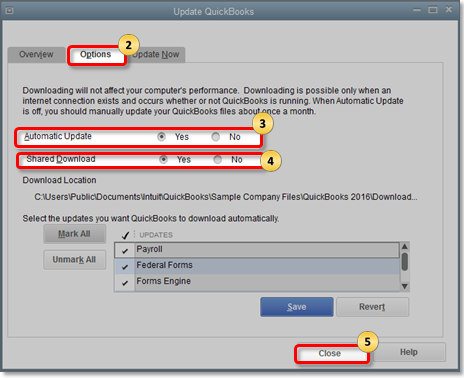 If you turn on Automatic Update, you're allowing QuickBooks to download the latest updates as they are released. If you wish to turn this feature off, we recommend manually updating QuickBooks once a month. Updating to a new release (example: R3P to R5P) usually requires a minor change to the database and doesn't require you to update your company file(s). This is different than upgrading to a new product version (example: 2017 to 2018) where the changes are major and do require you to update your company file. Do you have the latest QuickBooks Desktop patch? With QuickBooks Desktop open, press the F2 key (or Ctrl+1) on your keyboard. On the Product Information window, check the current version and release. From the QuickBooks Help menu, select Update QuickBooks. On the Update QuickBooks window, go to the Update Now tab. You can ignore the table because you don't need to change anything. Restart QuickBooks. When prompted, accept the option to install the new release. On the Update QuickBooks window, go to the Options tab. To turn on automatic updates, select the radio button for Yes. (Optional) To share automatic downloads with other computers on your network, select the radio button for Yes. Select Close. QuickBooks will now download the update when it's released. To update QuickBooks Database Server Manager, see Install, Update, and Set up the QuickBooks Database Server Manager. Close your company file(s), then close QuickBooks. Go to the Options tab, select Mark All. then select Save. If you have a Payroll subscription, download the latest payroll tax table to process payroll in QuickBooks Desktop. Note that your Payroll subscription must be active. Use the same steps as Option 2 to apply the critical fixes. Ensure Critical Fixes is selected before you download the updates.